I’m about to lay a big secret on you. I am the opposite of a baker. Honest. Measuring things out precisely? Oven temperatures? Rising times? Eeek! I’m more of a “throw in a little of this, add a pinch of that” cooker girl. Following a precise recipe makes me panic. And the wait time as the cookies are baking in the oven? I am constantly peeking in to make sure they haven’t spread out so thin they look like pancakes, which has happened. More than once. I don’t even know the difference between baking soda and baking powder. I should probably look that up. Let’s keep that secret just between us, m’kay? 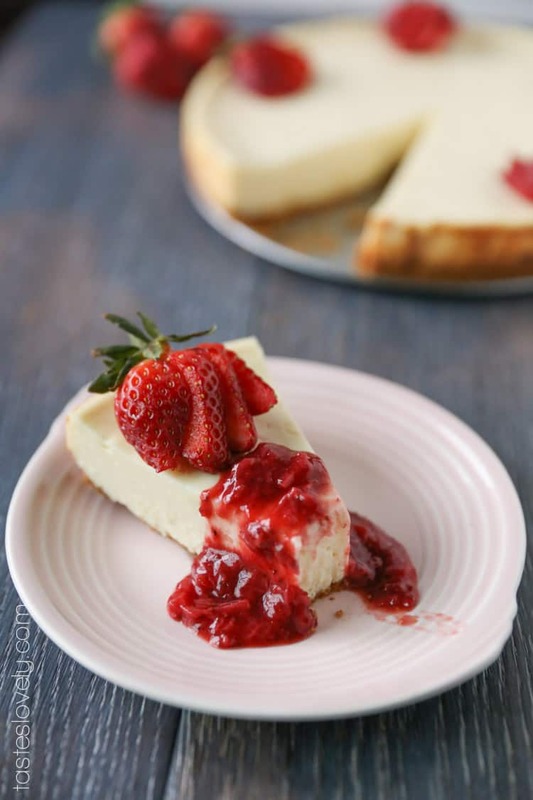 This cheesecake recipe is moist, ultra creamy, and practically melts in your mouth. Much creamier than your typical stiff New York style cheesecake. The crust is light and slightly crumbly. I’m not a big fan of super thick and hard crust, but if you are just add in more graham crackers and butter. 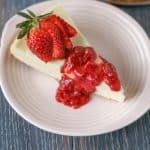 One of the best parts of this simple cheesecake recipe? It doesn’t need one of those water baths that I would surely spill while taking it out of the oven. It only takes about 25 minutes to bake in the oven! The real secret is to let it rest in the fridge for at least 1 day, but I like to do 2 or 3 days if I can resist eating it that long. The flavors deepen and it becomes the perfect consistency as it chills. It’s delicious plain, but I love it topped with fresh strawberry sauce. Feel free to mix it up and top it with your favorite topping. Raspberry sauce, caramel, chocolate sauce, I’ve even topped it with store bought cherry pie filling. Now who wants to come over and help me eat the leftovers? 1. Preheat oven to 350 degree and light spray a 9-inch springform pan with cooking spray. 2. In food processor with knife blade attached, pulse graham crackers until fine crumbs form. Add the melted butter and pulse until well combined. Transfer to the bottom of the springform pan and press with medium pressure into an even layer. Bake the crust for 6 minutes, then remove from oven. After you remove it from the oven, press the crust with your hand using medium pressure to ensure the crust sticks together. 3. In a stand mixer (or large mixing bowl with a hand mixer), beat the cream cheese with the sugar for 2 minutes. Add in the first egg and beat for an additional 2 minutes, then add in the second egg and vanilla and beat for 2 more minutes. Pour the cheesecake into the springform pan, and smooth into an even layer. 4. Bake for about 25 minutes. 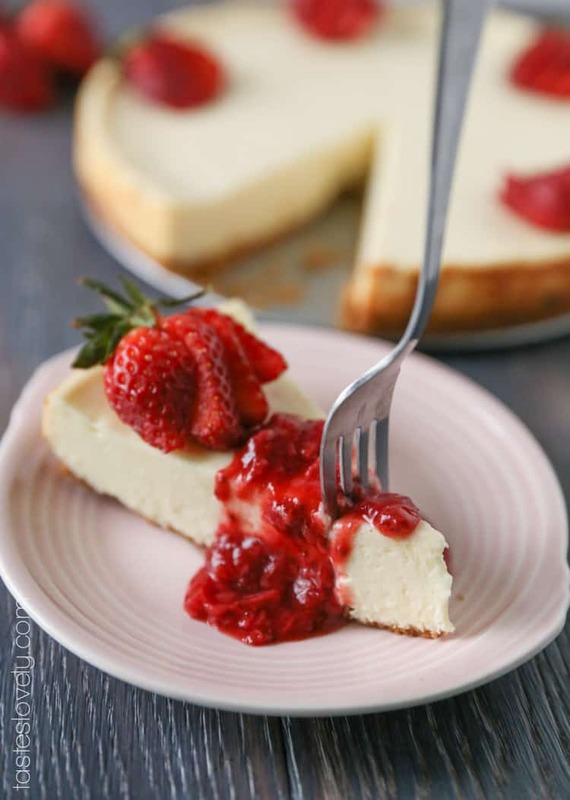 You will know the cheesecake is done when the sides look just set, but the center still lightly jiggles when you tap it with the back of a spoon. 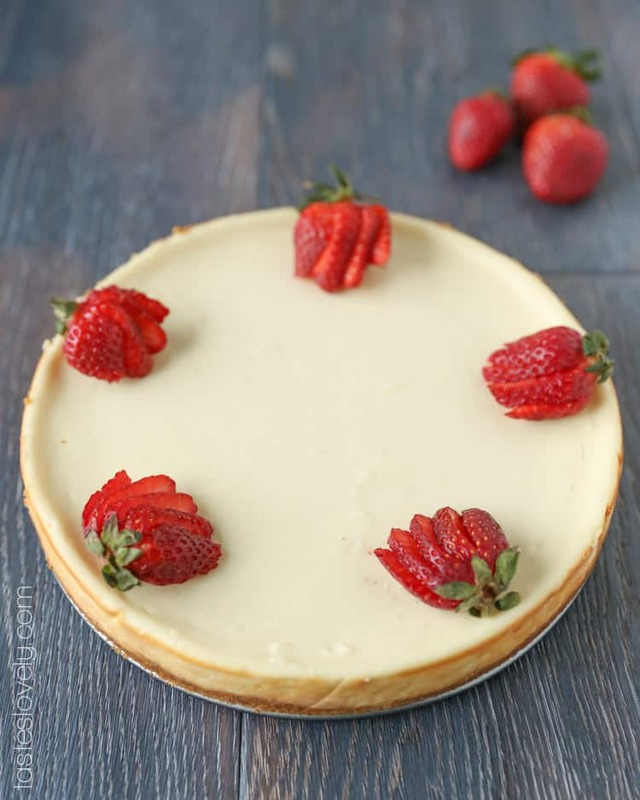 You do not want to over bake the cheesecake, the key is to have it smooth and creamy. Remove from the oven and allow to cool to room. Then cover the springform pan with aluminum and refrigerate for at least 1 day. 5. To remove from springform pan, first run a butter knife under hot water, then run along the edges of the springform pan to loosen. 6. Best served cold with your favorite topping. My favorite is fresh strawberry sauce. Will keep in the fridge for 10 days. 7. This cheesecake also freezes beautifully for up to 1 year. If freezing, allow to thaw for 8 hours in the fridge before serving. WOW!!! Natalie this cheesecake looks scrumptious. I am the same way, I am not a very good baker. Most of the time I don’t even like to bake. I don’t really know the difference between baking soda and baking powder either. I know I keep one in the fridge for freshness, but can’t remember which one. :) I will certainly make this cheesecake though. Probably next week for one of my girls at work. For not being a baker, this cheesecake looks pretty dang delicious!! Thanks Kelli! The first time I made this and removed it from the springform pan I couldn’t believe it was actually pretty. Haha! I get about 75% failed baking recipes. I may be cursed. I will! I’ll come and eat leftovers with you! :) This cheesecake is truly gorgeous, and I bet it’s a hit wherever it’s served. How can anyone say no to creamy cheesecake? Not this girl! This cheesecake looks just perfect!!! I love to bake but I love easy recipes and don’t even try the super hard ones but this does look just too easy! 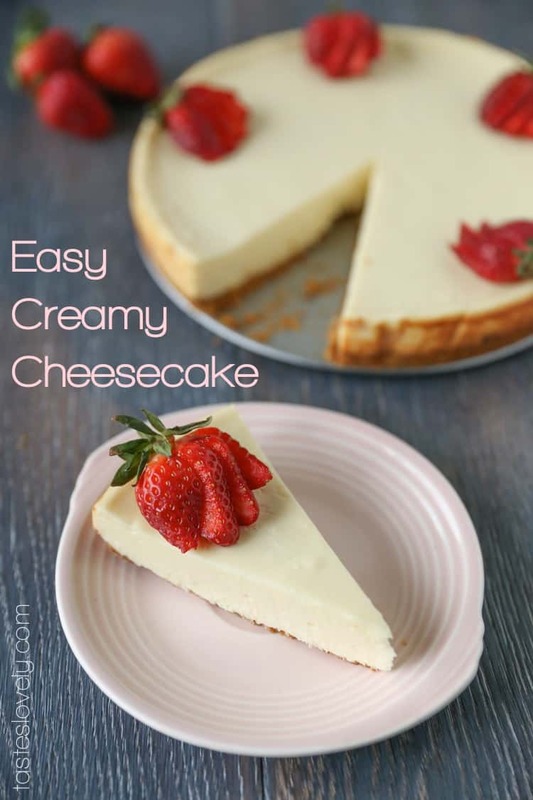 My husband would love this well I would too…who doesn’t like cheesecake!? Lol. You decorated this cake so beautifully and I would never be able to tell that you don’t like baking because you did an amazing job baking this cheesecake!!!! This is beautiful Natalie! And I AM a baker, and I still don’t know the difference between soda and powder…. Haha. You can definitely bake, looking at this cheesecake. This looks heavenly, especially because you had to go and put homemade strawberry topping on top of it. Gorgeous photos! Yum, I love cheesecake! I miss it, actually! And oh well, if you can’t bake…you can make a stunning cheesecake, how impressive is that?!? Me me me! I’m a great leftover eater! For someone who says they are not a baker, that is one fine cheesecake! Puh-lease come help me eat this Leah! I just ate another slice last night. I can’t stop! And you are so nice for saying that. I can promise you, no one was more surprised than me that this turned out to actually be pretty! 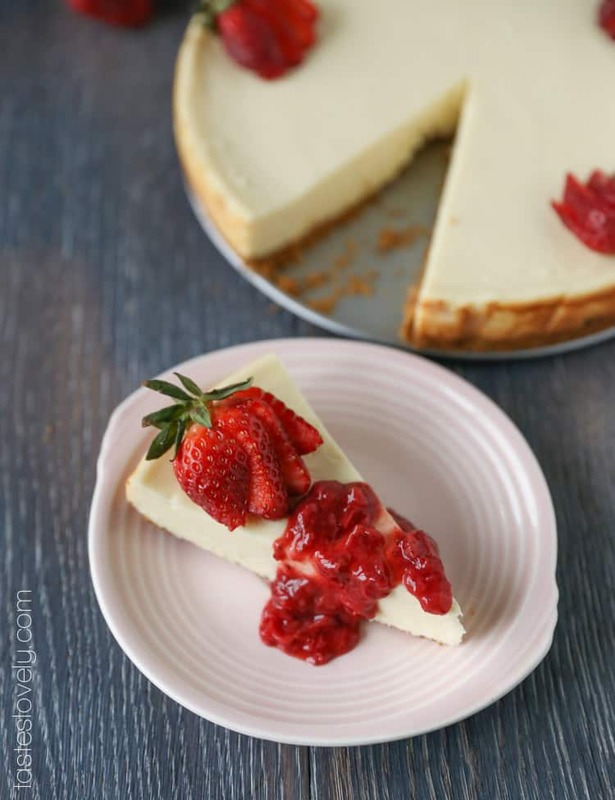 This you MUST try this cheesecake recipe Christine! It doesn’t get near “firm” enough to crack. And even if it does, just throw some fruit on top and no one will know any different. And you are SO nice to say that! I can promise you, no one was more surprised than me when this cheesecake recipe turned out well. It’s a bad baker’s miracle! This looks so perfect!! Also, a cheesecake that doesn’t need a water bath is a win in my book. Thanks for sharing the recipe! Thanks Bianca! Water baths totally freak me out. I feel like the water would somehow seep in for sure and my cheesecake would turn into soup. Hope you love it if you try it! Thanks Caitlin! This took me so long. I easily made this cheesecake 6 different times, and spent far too much money on cream cheese. Whoops. Glad it finally came out! And puh-lease be my pastry chef? I’m not much of a baker either! It’s something that I’ve had to really work on, but I find I hear a lot of people echoing the same thing, “I’m a cook, not a baker”. I’ve only made cheesecake once and it was a HUGE failure, and I mean, inedible failure (kind of funny now, but disappointing at the time). I think you’ve inspired me to give it another shot! I wonder how this would work with chocolate flavoured cream cheese….hmmm! Glad I’m not alone Lou! Baking just does not come naturally to me. I feel like there are either “cooks” or “bakers”, and I’m definitely a cook. 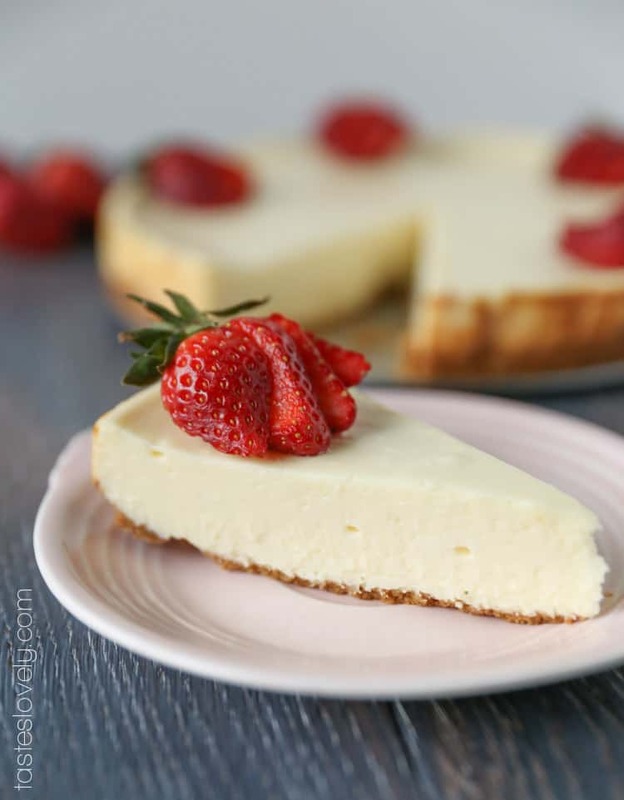 You must try this cheesecake recipe, I PROMISE it will turn out perfect. I made it at least 6 times until I got it right. And spent probably $50 on cream cheese. Ha! I’ve thought about trying this with different flavors, chocolate would be deeee-lish! You are SO nice to say that Alyssa! You should have seen the look on my face the first time I finally “nailed” this recipe. Took me at least 6 tries of major flops. There was a very crazy happy dance going on in my kitchen when I finally perfected this. I love easy too. You must try this if you’re ever craving cheesecake. So good! This really is easy … just my kind of recipe! This cheesecake looks wonderful Natalie!! All that matters in the end is if the food tastes good!! and your food always looks amazing! !